Originally was to be designed after a competition by J.J. McCarthy in 1846. The project was abandoned due to the Famine. A revised designed by Augustus Welby Northmore Pugin was started in 1842. The austere exterior (though the tower does have some fantastic gargoyles) masks an ornate interior with a wonderful roof. 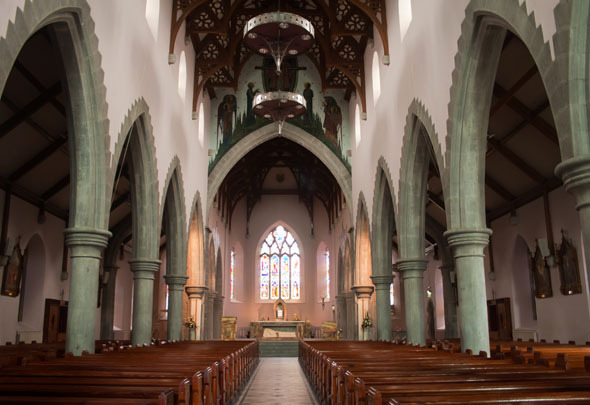 Later interior includes work by Harry Clarke – a windows depicting St. Patrick & St. Rose of Lima; a Connemara marble altar by Albert G. Power; and stained glass by Frederick Barff.